"Dax is our Doodleman Pinscher (half Poodle half Doberman Pinscher). He is a very friendly playful dog; he is only 2 years old in this picture and he does not realize he is over 55 lbs. and not a "lap dog." We find his breed very unique and beautiful. He and our Goldendoodle Charlie are the best of friends." The Doodleman Pinscher is not a purebred dog. 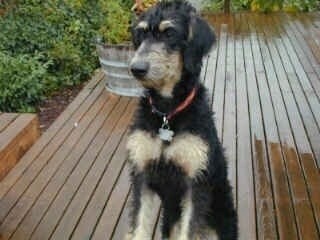 It is a cross between the Doberman Pinscher and the Standard Poodle. The best way to determine the temperament of a mixed breed is to look up all breeds in the cross and know you can get any combination of any of the characteristics found in either breed. Not all of these designer hybrid dogs being bred are 50% purebred to 50% purebred. It is very common for breeders to breed multi-generation crosses. 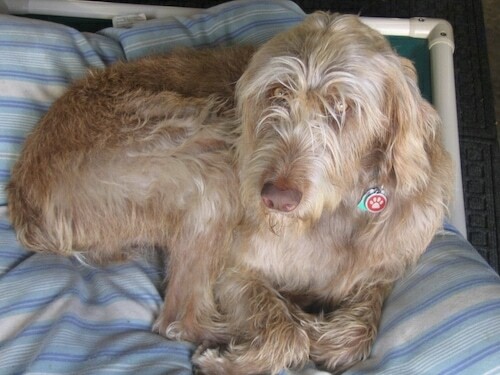 "4-year-old Doberdoodle (as I have called him for 5 years) is out of a reg. white standard female by a reg. black and tan Doberman, both show dogs as the breeder told me. He is very much like both breeds at times. Clips down to very 'Poodle-ish' with a very slender muzzle. He weighs 75 pounds and is extremely athletic. His name is Albert." "Here is a picture of Wilson one of our Doodleman Pinschers that we breed here at Aspen Kennels. Wilson is a fawn / silver beige Doodleman Pinscher."